RUGBY fans will be left out of pocket as touts cash in on inflated prices for Six Nations tickets. With no tickets remaining for Scotland’s two home clashes with England and France, desperate fans have been left with no alternative but to pay up to £2,200 for a chance to enjoy the action. Ticket website Viagogo is offering tickets for the Calcutta Cup clash with England for £2,200 - with the cheapest tickets on offer for a whopping £340. The prices come amid reports that rugby fans are cutting their Six Nations visits to Edinburgh short due to being priced out. 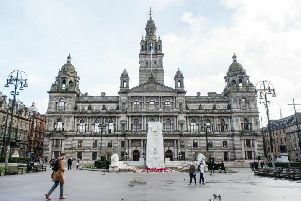 The Edinburgh Hotels Association revealed that some fans are now only spending one night in the Capital - compared to as many as three or four in previous years. It’s not just games at Murrayfield that have seen inflated priced. Adult ticket prices were set by Scottish Rugby at £99.96 for platinum, £94.86 for sold, £73.44 for silver and £51 for bronze. No tickets are currently available through the official Scottish Rugby website, but it does indicate that a “further limited sale is expected” before the games.